Yellow Sapphire is available from Srilanka mines, colour is from very light yellow to dark yellow like whisky. Generally little haziness, cloud, silklines, feather is seen in good quality.In smaller size purity is available. Yellow Sapphire comes under Prescious stone. Colour radiation is Blue in colour. Please reffer the site Prescious Stones. In English yellow sapphire is also known as Topaz, but the Topaz is completely a different stone then yellow sapphire. Topaz is comes under semi-prescious stone. Beware at the time of purchasing the Yellow Sapphire, otherwise instead of yellow sapphire you might purchase Topaz at the rate of yellow sapphire. In food industries, eatebles, catering, provision stores, household items, religious, etc.. the rulling planet is Jupiter. 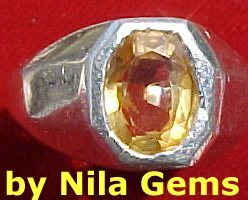 Yellow Sapphire is available from 5 cent size to 23 cts. size. Rate wise from Rs. 500/= per ct. to Rs. 15,000/= per ct.
$ 10.00 per ct. to $ 300.00 per ct.
RAJAWADI BRANCH, GHATKOPAR-EAST. MUMBAI - 400 077. MAHARASTRA. INDIA.